Microsoft today showcased a device that many people weren’t expecting as it didn’t even leak out. The October 6th briefing event saw the introduction of The Microsoft Surface Book, a two in one laptop to the media and public. The Microsoft Surface Book weighs 3.34 pounds (1,516 grams) including keyboard, it’s 13.5” with PixelSense display at a Resolution of 3000 x 2000 (267 PPI), 3:2 aspect ratio like the other Surface Pro devices and 10 point multi-touch. The laptop comes in two variations i5 and i7 both 6th generation processors has up to 1TB of storage, Intel HD 520 graphics (for just i5) and optional discrete (i5/i7)NVIDIA GeForce 8G graphics. The Microsoft Surface Book has two full-size USB 3.0, SD card reader, headset jack, mini displayport. 5.0MP front and 8.0MP rear camera with autofocus, it has 12 hours battery life, the casing is magnesium and comes in silver. 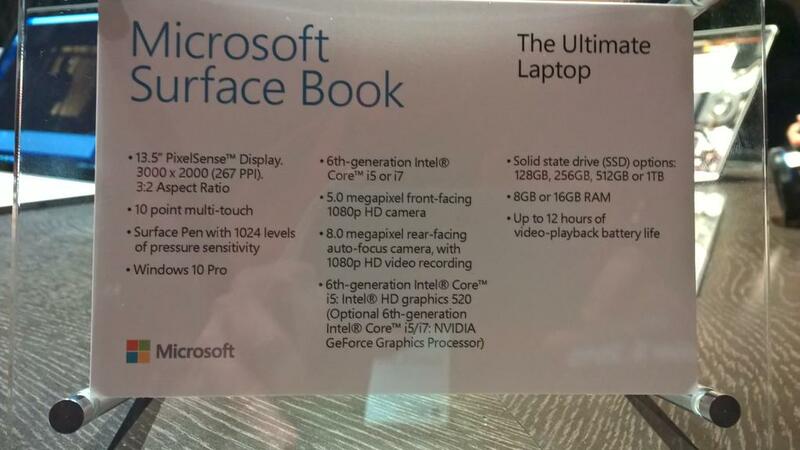 The Laptop is able to pre-order today and it will be available on October 26th 2015. Pricing for the device starts at $1499.